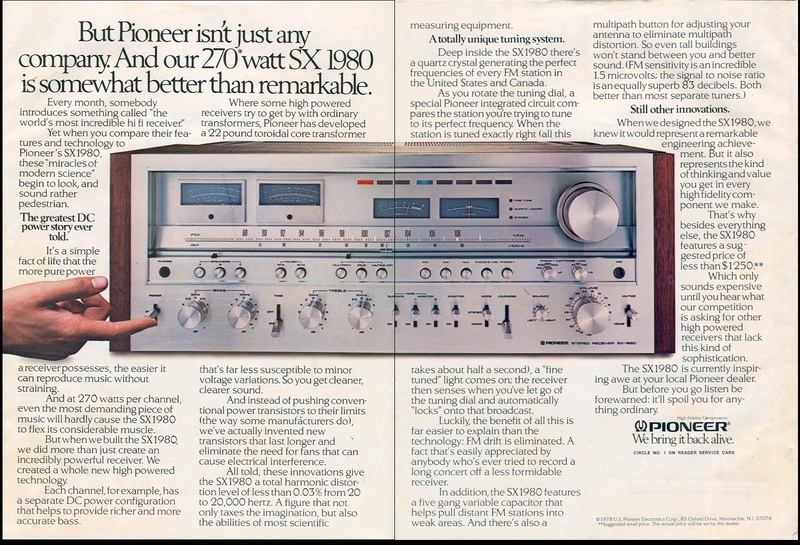 Pioneer SX-1980 – The Holy Grail of Vintage Receivers? This is it! The Big Kahuna! The most powerful Receiver of its time! What else do I need to say? In the 1970’s Pioneer was not just a meaningless brand name. The company had truly led the industry not just in cutting edge research and development but also in terms of design and aesthetics producing industry firsts in many areas. As their brand suggested they were in fact Pioneering the brave new worlds of stereo. 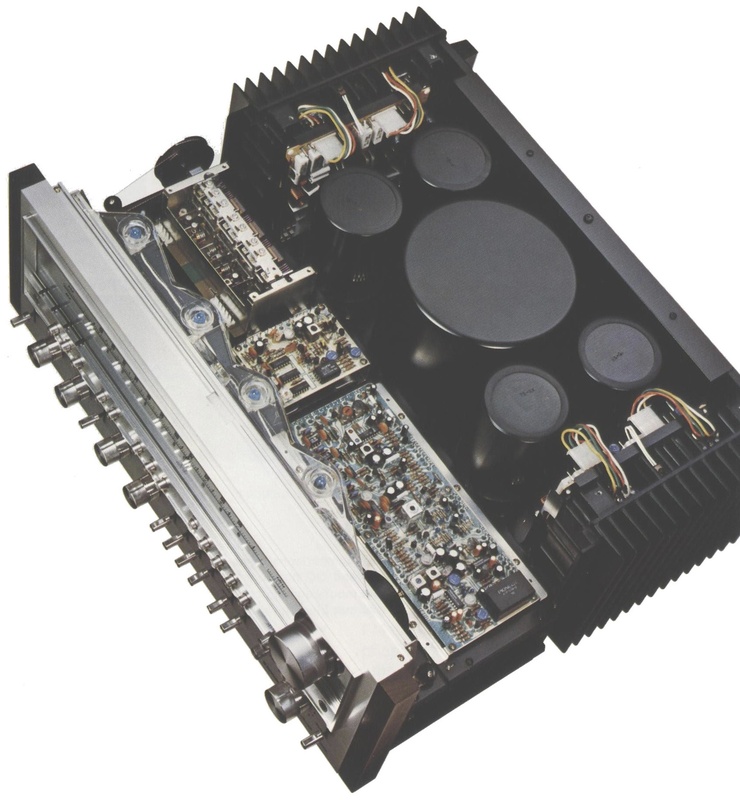 They were the first company to introduce a 100 Watt RMS Receiver, a 160 Watt RMS Receiver and a 270 Watt RMS Receiver. They say that imitation is highest form of flattery, and Pioneers aesthetics heavily influenced their competitors with even Marantz imitating aspects of their design. 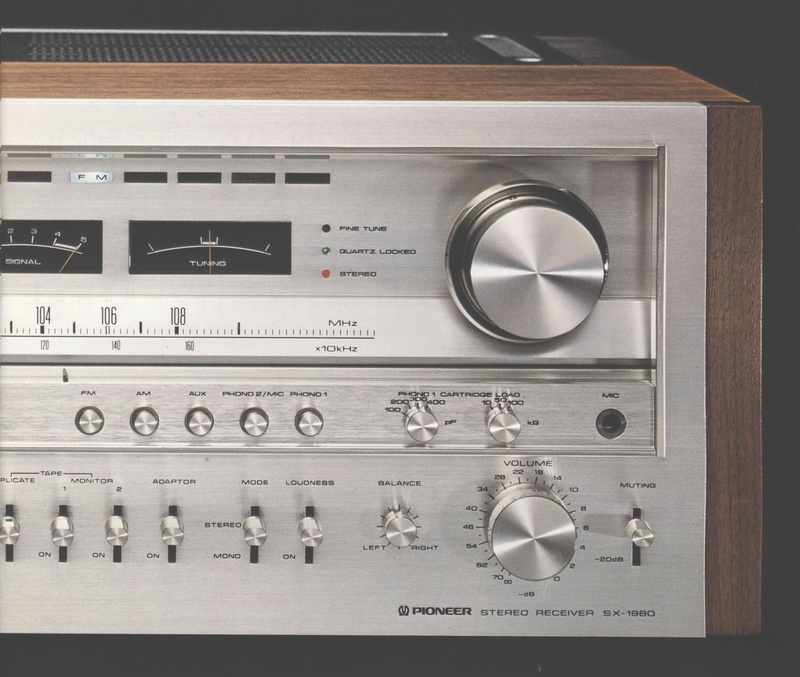 The Pioneer SX-1980 was their flagship top-of-the-line Receiver from 1978-1980 and was the most powerful Receiver on the market upon it’s release. It is no overstatement to say it is one of the most desired and sort after vintage amplifiers on the planet today. Sure there’s the Sansui G33000, the Kenwood KR-9050, Marantz 2600 and the Technics SA-1000, however these were created after the SX-1980, and mostly because of the SX-1980 in the first place. All of them are excellent receivers with their dedicated followers, but none of them have inspired the wide popularity and almost cult following that this receiver has. This was Pioneer’s last receiver built for the Receiver Wars. Released in 1978 the SX/80 Series followed on from the extremely successful SX/50 Series and saw subtle but stylish aesthetic improvements and increased wattage throughout the range. 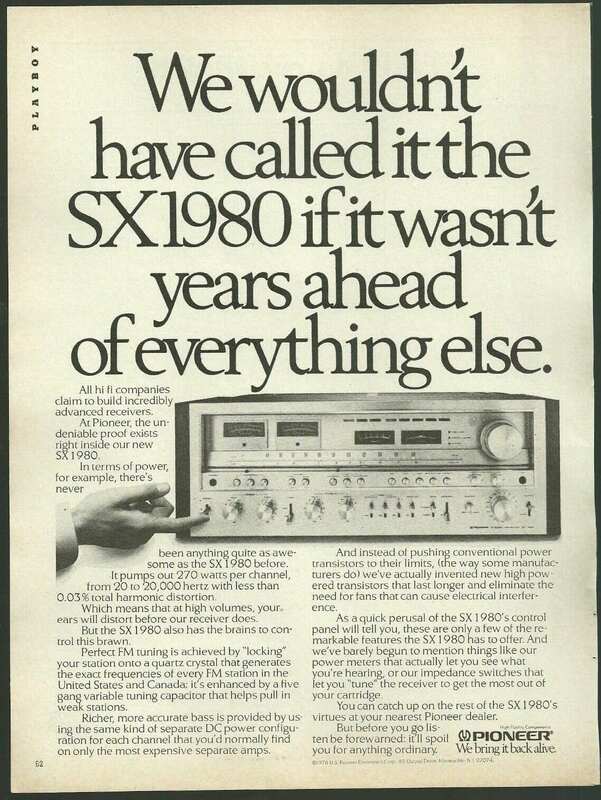 It also saw the introduction of a new top model – the SX-1980. Pioneer had again raised the bar in the final years of the Receiver Wars. The amazing power-supply section of the SX-1980 with it’s dual wound toroidal core transformers and a total of 88,000uf of Capacitance! Note: the shielding covers have been removed in this photo. Building on much of the technology of the SX-1250, the SX-1980 included some subtle technical additions. Other than the increased wattage the other metric that saw a massive improvement over their previous model was THD – which saw a reduction from 0.1% to a tiny 0.03% across it’s entire power spectrum. 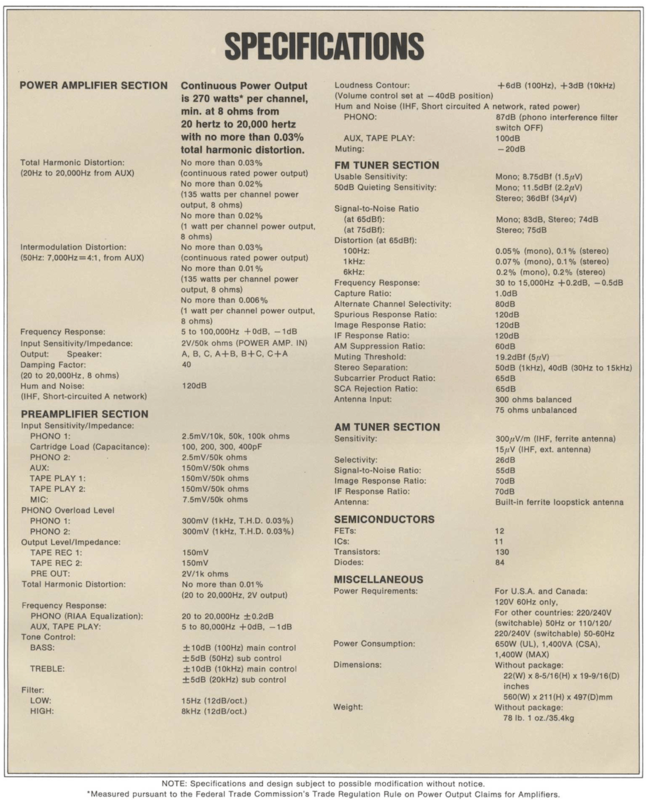 The amplifier consisted of a cascade connected, current mirror loaded, differential amplifier with a three-stage Darlington triple parallel-push-pull direct coupled OCL circuit. Just try saying that three times! With a dual power supply arrangement incorporating a massive toroidal-core transformer with two independent windings and four ‘Coke Can Sized’ 22,000uf filter capacitors provides the amplifier with an enormous reservoir of power to draw from. Vinyl fans will love the the phono section on these units with 3 cartridge impedance and capacitance settings for the phono input and a 500ma phono pickup that cannot be overloaded by any magnetic cartridge. 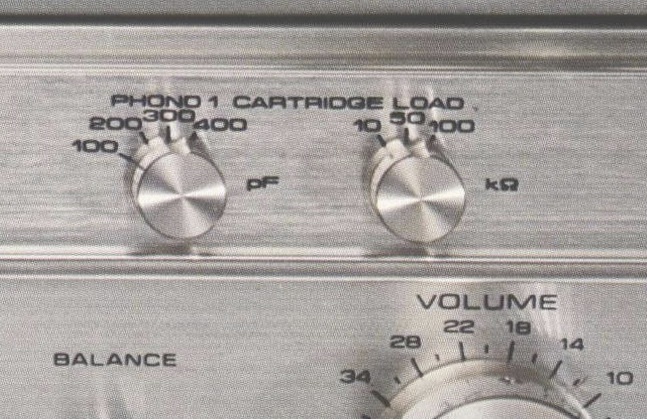 This model also featured Pioneer’s unique dual tone controls for Bass and Treble which they boasted would give you tens-of-thousands of tone combinations. Physically this unit is impressive measuring 56cm (22″) Wide X 21.1cm (8 5/16″) High X 49.7cm (19 9/16″) Deep and weighs an incredible 35.4Kg (78 lbs). Its brushed aluminium fascia is one of the most attractive ever produced during the 1970s and would stand out as a feature in any lounge-room. Got an SX 1250 I never use….oh whell…. I owned this receiver in 1985 purchased it in mint condition for $500 Australian dollars. 1 owner in Mint condition. Sold it a year later for $1000 in 1986 to a guy that just had to have it. I have regreted the sale ever since. I still remember the effortless power of a drum beat thru a huge pair of yamaha speakers similar to ns1000s the meters ficking into the 200 watt zone. Never to this day have i heard anything equal to power and tone of this thing. I do remember when i switched the power on, all the lights would dim in the house for a few 2nds similar to a welder just turned on. Now a mint one is Thousands.